Flint Cliffs offers a full service manufacturing and painting facility under one roof with 147,000 square feet of manufacturing space. With a wide array of equipment and painting capabilities, Flint Cliffs is a one-stop shop that enables cost savings and quality control with most jobs being fully completed in-house. Further strategic partnerships with trusted and established suppliers allow fulfillment of every manufacturing need. Industries served: Agriculture, Construction Equipment, Food, Recreation, Communication, Home Improvement and Federal Government. 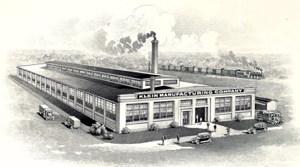 Founded in Burlington, Iowa in 1908 by Arnold Klein as Klein Manufacturing, the company was one of the nation’s leading full line outdoor feed and water equipment manufacturers. Specializing in round hog feeders, products were offered under the brands Big Husky, Pork Pro and K-Line. As the market moved into confinement style hog production, the company began to explore opportunities to develop other product offerings. John Schulz purchased the company in 1993 and changed the name to Flint Cliffs Manufacturing and expanded its manufacturing capabilities and services. Lance brings over 30 years of business experience including two successful manufacturing start-ups. For current employment opportunities, please call 319-752-2781 or email us.